We left our mooring at Marina Cay with Bruce on the bow to watch for shallows. We slowly motored out between Tortola's Beef Island and Great Camanoe, then turned to thread the needle between Great and Little Camanoe. This was the part that was touchy. We could see the bottom clearly and with land very close on either side of us, we saw depths of 8 ft. Now this would cause no concern back home, but here in the land of unforgiving reef... I was nervous. But, being the pro that I am... I made it all look so easy! Once around and through the tight spots, she let the dinghy out to cruising position and we sailed leisurely up the coast of Tortola. The kids were really getting good at this. Melissa knew the drill. We had another grand lunch of cold cuts under way. Then we settled back to enjoy the view. Upon arrival at our next destination, Cane Garden Bay... the girls and I left Bruce on the boat and went ashore. We wanted to go and visit the Callwood Distillery. Rum is my new hobby and I had read about this place in a book. Bruce said that he and some friends had begun the hike up the hill to visit it once but the trek was so arduous, they gave up and never found the place. He pointed the way and settled into the cockpit with a coldie. We walked along the quaint main street of Cane Garden Bay in the positively STEAMY air. A shower had gone through and left the streets wet and the tropical foleage was thick and lush from all of the rain they receive daily. Off on the boat, it's not so damp, but here! Wow! We walked along the flat road past the kiddies in school. Everything here seems so small and simple. You know you're living right when mainstreet looks like this! No traffic, no stress, no hustle and bustle. Just shore and jungle. Ahhh! We bounced along feeling the tension ooze out of our bodies. Soon, the street took an upward turn. About a 45 degree upward turn, and we realized that it wasn't tension oozing out of our bodies, but SWEAT! We trudged along laughing about how this was good for us, and it was fun, and we needed it after all we had been eating and drinking. We got to the first level spot on the road and stopped to catch our breath, sweat dripping off of us. We were rewarded by a grand view of the anchorage. We took off on the next steep incline and were passed by a couple of cars. One guy stopped and asked us if we needed anything. We told him "Oh no, we're heading up to the distillery". He laughed and said we had passed it way back down on the flat. WHAT! That Bruce is in deep trouble! We spent the entire return downhill planning Bruce's demise. We laughed a lot though. We HAD needed the walk. We got back down to the "flat" and found this entrance to the distillery. No wonder we had missed it! We crossed the bridge and stepped back in time. The place was just a run down tumble of rocks in the jungle. We tentatively walked in through the door and found the room full of oak barrels holding the brew. There were a couple of locals there to show us around if we wished to buy a bottle or two. Well of course we wanted a bottle or two. We had a little taste of the spiced rum, the dark rum aged 4 years and that aged 10 years, as well as the white rum. We bought bottles of the first 3. The 10 year old rum was very smooth. By the time we were done, we were all fast friends! We walked back out into the jungle and paused to check out the sugar cane growing wild there. The Callwood Distillery makes its rum using the pot distilling method from cane juice. Back in the heyday, it was grown here on the island and harvested to make much more volume than they do now. Our guide climbed up into a mango tree to see if he could find us a ripe one. He went as far up as he could safely go and found nothing ripe so we went empty handed. But afterwards, I began noticing the mango trees. All of them had ripe ones high up above a certain line. People had picked all of the ones within reach on every tree we saw. We went on to see where the juice was squeezed out of the cane into a bathtub. 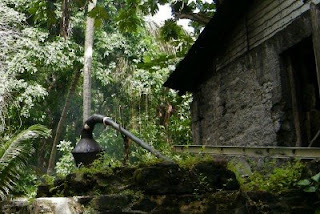 Then they used the dry cane left over to fuel the fires to boil the cane juice into syrup. This was the oven that they loaded the cane into, now long cold. They are only making small batches now. Next we saw the pot where the syrup was distilled and run through a pipe to drip into a bucket inside the main room to be poured into the oak casks where it is aged. We had a great time checking it all out and tipped the boys well. We took our bottles and walked the short distance back to where we had left the dinghy by way of the beach. On the way we did a bit of shopping on the way. A guy named One Love tried really hard to sell us a CD of some local band that unfortunately wasn't playing anywhere here tonight. He was very persistant but we escaped. We stopped by the "big motel" to pay for our mooring ball as no one had been by to take our money when we left the boat earlier. It's so simple and slow. It takes a while to get used to it and not be annoyed by the lack of concern about getting things done. We were hot and the water was calling us when we got back to the boat. I worked on boat drinks while Brittney worked on the floatie. Then we got wound up... and things got to be more interesting. We laughed and played in the water for an hour. Bruce stayed aboard and became our designated driver for the evening. As the day turned into evening, our thoughts turned to dinner. We had to get "showers". In order to conserve water, this is done by lathering up in the water off the back of the boat. Then you rinse off in the water and use the freshwater on board only to rinse the saltwater off of yourself. We got done and nearly froze in the process. Next we were on to dinner on shore. We were headed for Myett's as they had come highly recommended by our distillery guide. We have linked your blog to Cane Garden Bay on Good Anchorage for fellow mariners to read local knowledge & reviews.